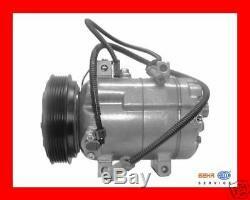 Air conditioning compressor audi coupe'- audi cabriolet - 13010. The description of this item has been automatically translated. If you have any questions, do not hesitate to contact us. 88.16.134. Air conditioning compressor with compulsory rendering old compressor carcass a revision. The carcass of the old compressor, it is important, it is intact, even if does not work, will be removed by courier upon delivery of the new, everything is included in the price. Oe codes: 077260803ad 8d0260805e 4a0260805ah 4a0260805ad 4a0260805ab. Audi-cut (89, 8b) - 2.6 anno 08.92 -12.96 - kw110 cv150 < cc2598 audi-cut (89, 8 b) - four anno 08.92 -12.96 - kw110 < cc2598 audi-cut (89, 8b) - 2.8 anno 09.91 -12.96 kw128 cv174 cc2771 audi-cut (89, 8b) - 2.8 four anno 08.91 12.96 - kw128 cv174 anno 06.93 - 08.00 - kw110 cv150 cc2598 audi cabriolet (8 g 7, b4) - 2.8 anno 11.92 - 08.00 - kw128 cv174 cc2771. Be certain that this item is what you are looking for, check your car's technical data with your registration! As for example below comparing : model-year-kw and the engine number. In some cases, this data is not enough, therefore, still booklet if requested by us, to confirm the applicability, that you must provide us the original codes listed directly on your part does not work! All our prices are including VAT! When to buy please tell us your tax code or VAT to allow us an invoice. Tempi di consegna from 1 to 3 working days by express mail gls of receipt of the order. Warranty: All our products are 1 year warranty. Please note: the photo inset are purely demonstration . If the object above did not satisfy your search please contact us, we have what you need! Contacts: tel / fax 0805611080 web. The item "audi air conditioning compressor coupe 'audi cabriolet 13010" is on sale since Tuesday, May 22, 2018. It is in the category "auto, motorcycle parts, accessories \ auto \ parts \ air conditioning, heating \ others". The seller is "dibardibar" and is located in / bari, ba.